It is chilly during the winter months, and there has been very less snowfall in the recent years. It starts to warm up by the end of march, and the spring season is quite pleasant. The summers are warm and temperatures go upto 30 degrees, but the evenings are cool. The Rainy season starts by the end of June and by end of August Shimla becomes sunny and pleasant back again. The fall season is warm and you have wonderful colours all around. The mercury begins to plummet in early November. 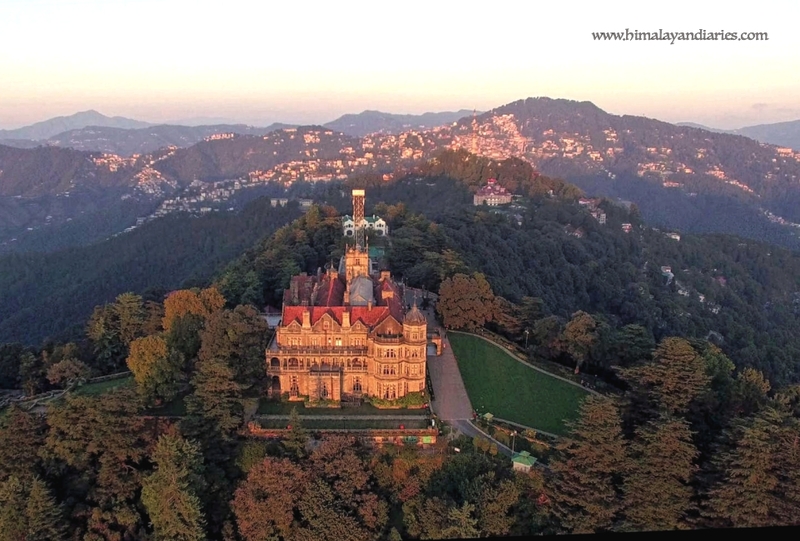 Shimla is 350 Kms from Delhi and 120 Kms from Chandigarh. The highway is being widened presently. There is also an narrow gauge rail network to Shimla from Kalka. This is also been declared as an International heritage. The nearest airport is at Chandigarh, which has flights from all major centres in India. All major mobile networks funtion here. 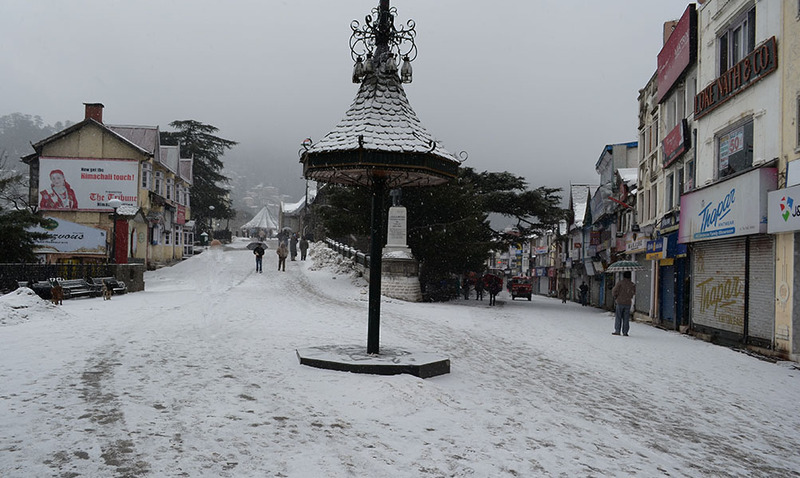 Shimla has very unpredictable weather, and it can become cold anytime, so keep a warm garment handy. If coming by your own vehicle arrive early, so that you get a place to park. Shimla has a huge Parking problem. Please do not make faces at the monkeys or try to feed them. Never venture into the high mountains without a proper trained guide and never try to enter flowing rivers to take photographs. It can be fatal. 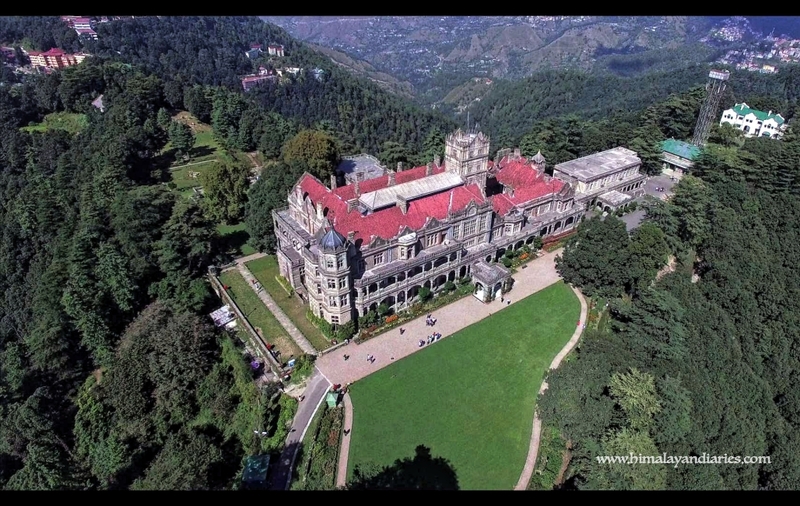 Shimla is 110 km from Chandigarh. The road journey takes about 4 hrs by car and about 5hrs by bus. 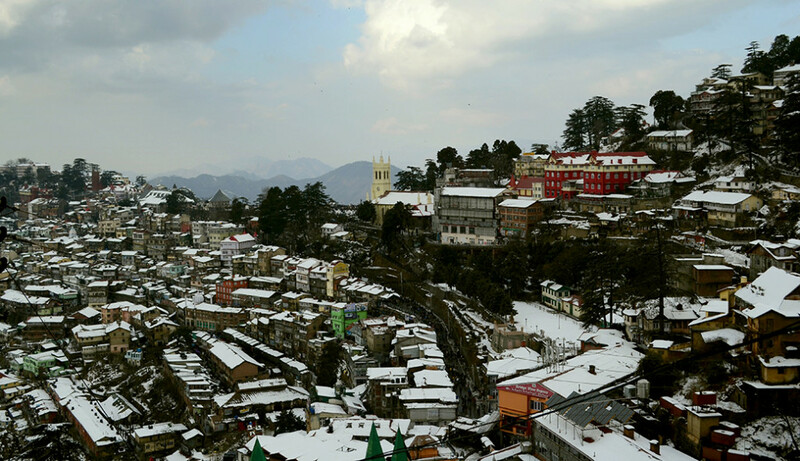 Out of all hill stations in India, Shimla has always had its own charm, basically due to its pleasant climate, easy accessibility, and an easy base for all exhilarating routes to the State’s far away areas. It still has various heritage buildings constructed by the British. There are places in Shimla, where vehicular traffic is never been allowed. You have to access these places on foot, which further adds to the charm of the place and inculcates the habit of walking. 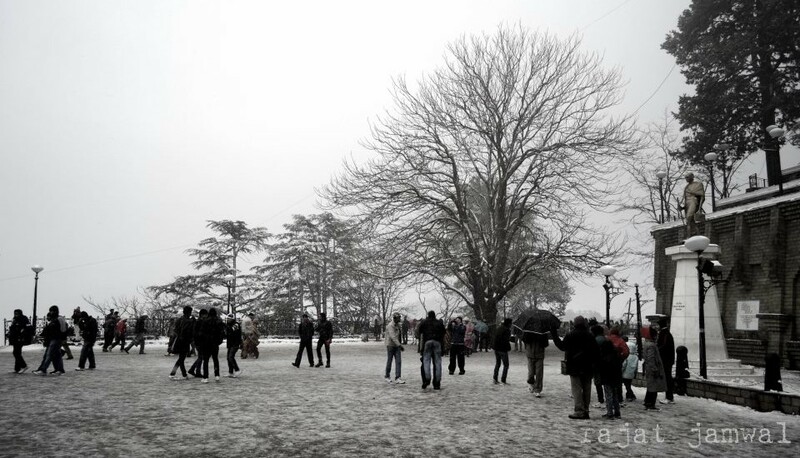 There are plenty of short walks in and around Shimla. recreations take place since British times. Still all cultural activities and traditional functions take place here. Then there is the town hall, centre to all administrative works in Shimla and the office of the Municipal Corporation of Shimla. Both these are heritage buildings. A walk here is just a lifetime experience. Just above the Mall Road walk, is a flat area, known as Ridge maidan. This area is always packed with people, mostly tourists, enjoying the view of the snow clad Himalayas, or the locals just basking in the sun. There are a few Maple trees here, which were brought from Kashmir. You have a 360-degree view from here. Towards the north you can have a fascinating view of the snow clad Pir Panjal ranges. There is a statue of a Father of the nation, Shri Mahatma Gandhi. There is also a small park, which has a famous statue of ‘Him Bala’, symbolizing the purity and generosity of a pahari girl. 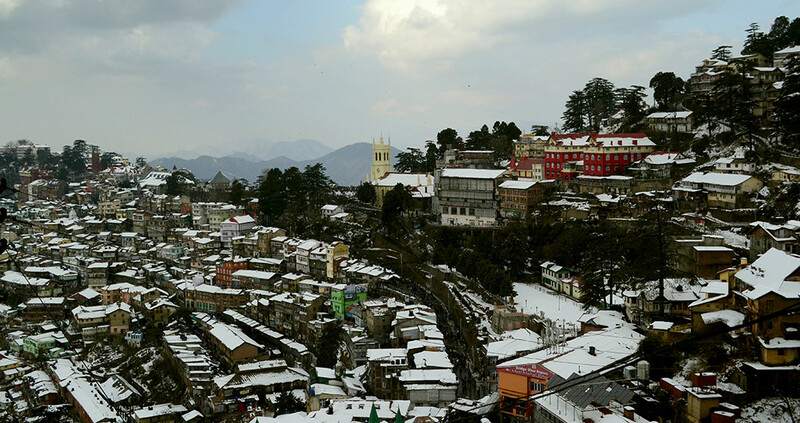 The Ridge also has the most prominent land mark of Shimla – The Christ Church. The other very prominent building here is the State Library building. The Ridge maidan is also used for public meetings, and festivals. Every year during summers, a Shimla Summer Festival is held here, which showcases various traditional dances and songs of Himachal. small grounds all around. The Viceregal lodge was designed by British architect Henry Irwin and built in the Jacobbethan style during the regime of Lord Dufferin. the ancient artistic, historical, archaeological and ethnological human works in order that the future generations may have access to the cultural treasure it has inherited from the past. Since then the institution has played a significant role in collecting and preserving the scattered cultural heritage, which otherwise was endangered and was on the verge of extinction. there is no haze, you can see the snow clad Himalayan range at a distance. The walk takes about an hour. The other famous temples in Shimla include the Sankat Mochan temple dedicated to Lord Hanuman, which is connected by road, and Kali bari temple, which is a short walk from the main mall road. 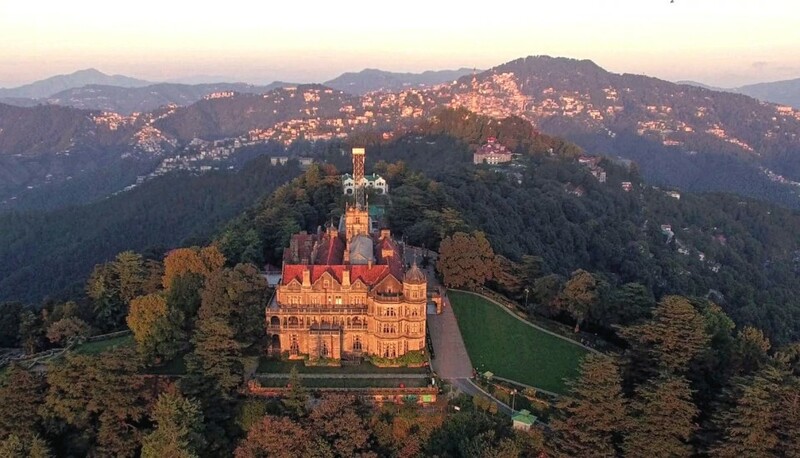 Situated at a modest altitude of 2044 m, Naldhera is just 22 km from Shimla.This place takes you away from the hustle bustle of the crowded Shimla Town. This place has it’s own vibes of quietness and tranquility , and one can just relax here in solitude. The area has lots of meadows which is surrounded by lust green Deodar and cedar trees. It is famous for long walks through forest trails, and pony rides. It has one of the oldest nine hole Golf course in the country. 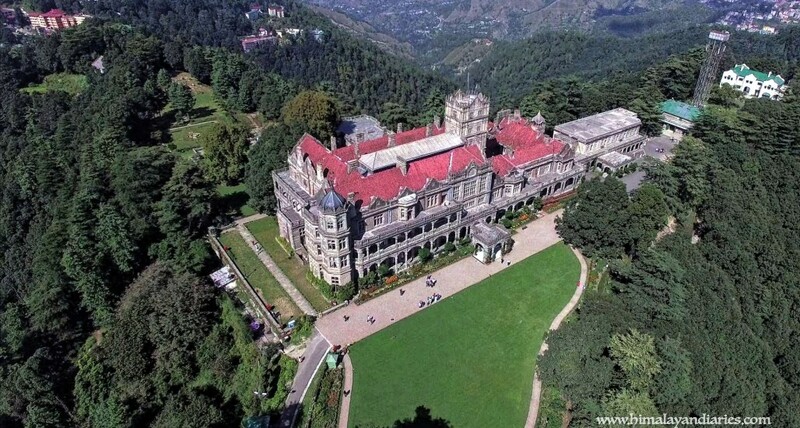 Located at an elevation 2146 m, Mashobra is about 10 km from Shimla. This village is connected by a road which is used during the winters when the main highway towards Kinnaur is blocked due to snowfall. Mashobra gives tourists a taste of history and scenic beauty. This place is part of Shimla Reserve Forest sanctuary and catchment area. The natural vegetation comprises pine, oak, cedar or Himalayan deodar, and rhododendron, as well as maple and horse chestnut. The wildlife consists of baboons, jackals, kakkar (barking deer), and lots of leopards are spotted here lately, as well as numerous bird species such as the Himalayan eagle, pheasants, chikor and partridges. 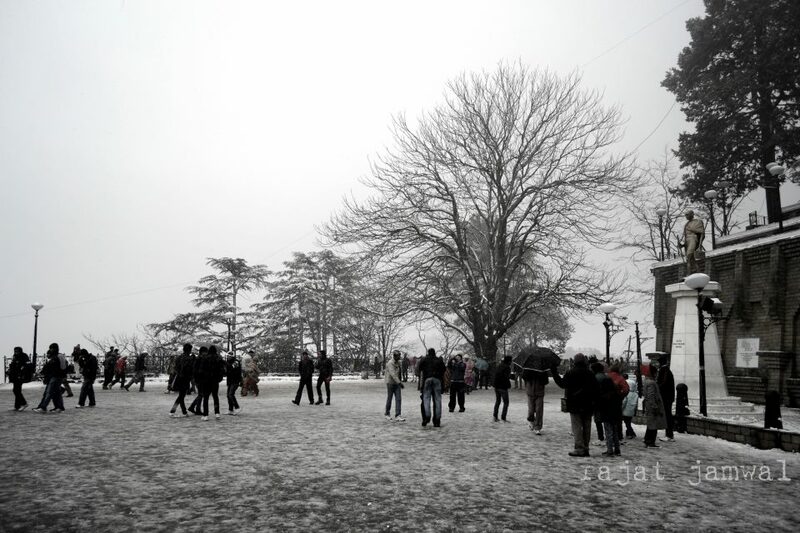 This place also is a escapade for visitors who just want to be away from the Shimla hustle bustle. Situated at an altitude of mere 656 m, Tatapani is a tourist destination located on the banks of the River Sutlej. This place is more famous for it’s rafting sites. Tatapani also has a few hot water sulphur springs. This is a small village 13 kms from Shimla at an elevation 2514 m. The entire area around Chharabra is densely forested and is part of Shimla Reserve Forest Sanctuary and water Catchment Area .This place has a magnificent view of the snow clad Himalayas, and one of the densest forests in Asia. There are a few small treks here, the more famous one being a short walk from Dhalli to Charabra, and another between Charabra and Kufri. Situated at an altitude of 2990 m, some 13 km from Shimla, towards the interior hills of Himachal, is the quiet and forested town of Kufri. It is famous for its pony and yak rides through forest trails. A lot of amusement parks have come up in the area. There is a forest of Oak, Pine and Rhododendron. The view towards the south holds the snow clad Shiwalik ranges. Peaks like Kinner kailash and Shrikhand are visible from here. 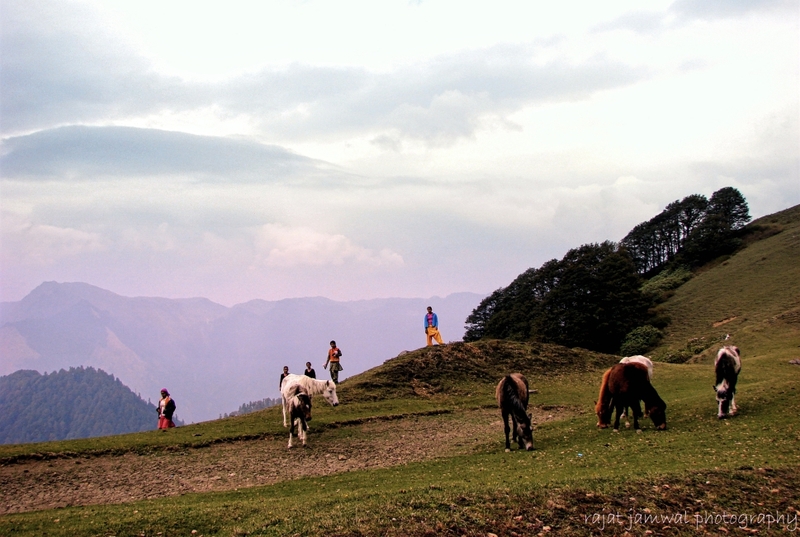 Located at an elevation of 2250 m, Chail is about 45 km From Shimla via Kufri, and 55 Kms from Kandaghat. Kandaghat is located on the Chandigarh Shimla Highway. The tourist destination has a very interesting history. During the British rule. Maharaja Bhupinders Singh was ousted from Shimla, the summer capital at that time. The made the Maharaja very angry and he decided to make a summer capital especially for himself. So the selected the serene location of Chail for the purpose. The village was admist a lush forest of Deodar and Rhododendrons. 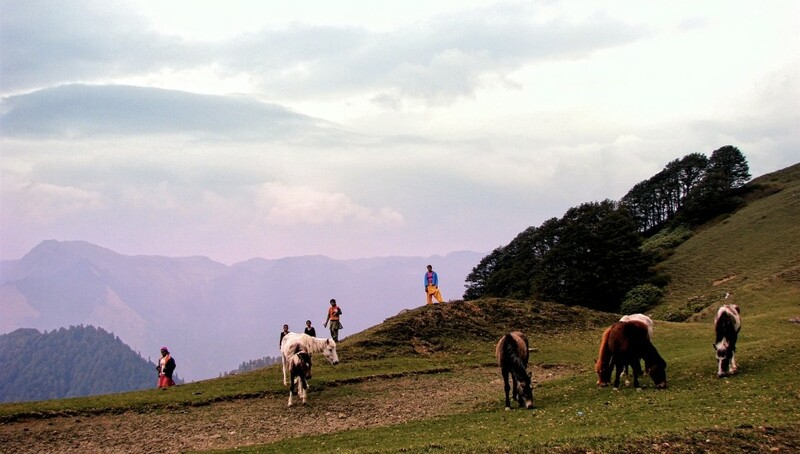 Over the years Chail has become a favourite destination for visitors from all over due to the tranquility it offers, admist a very charming location. The summer climate is also very pleasant, so lots of summer camps are being established in this area especially near a place called Sadhu Pul. A Kilometer away from Chail is the famous Sidh Baba Temple. 3 Kms away, there is also a cricket Ground, which is supposedly the highest full size cricket ground in the world. 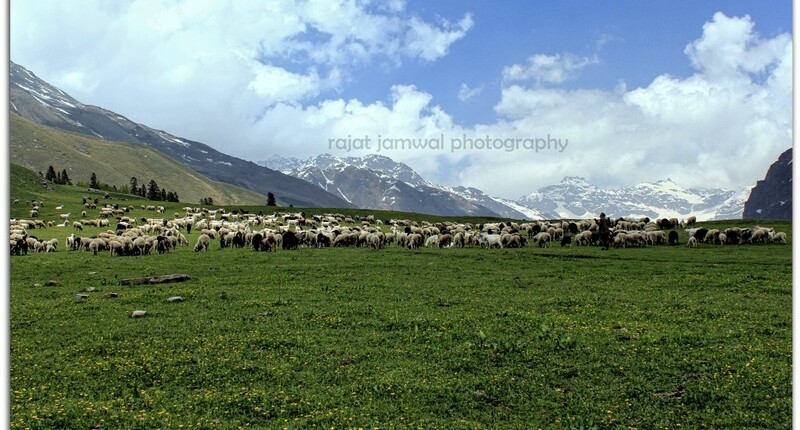 Fagu is a small hamlet, located on Kinnaur-Spiti highway. It is 22 km from Shimla. This place is a heaven for tranquility lovers because it is away from the crowdedness of Shimla and its nearby tourist spots. It offer a great view of the snow bound mountain. There are lots of forested areas around, where one can go for short walks and excursions. Fog characterizes the hillside landscape endowed with romantic ambience. 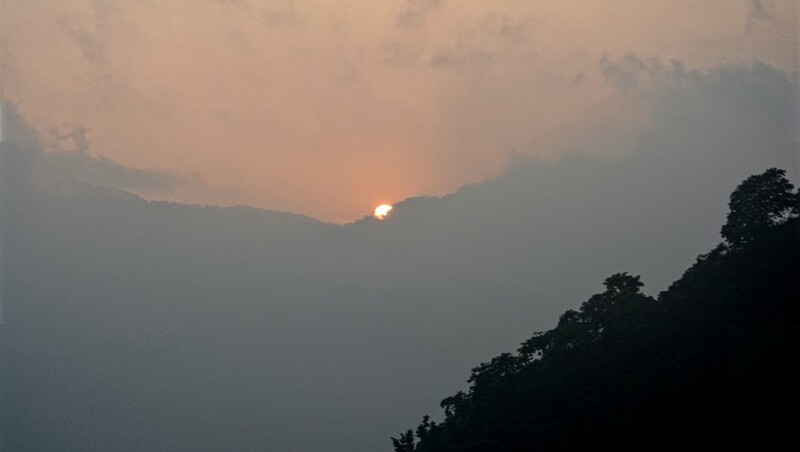 At an altitude of 2708 m, Narkanda is 64 Km from Shimla. 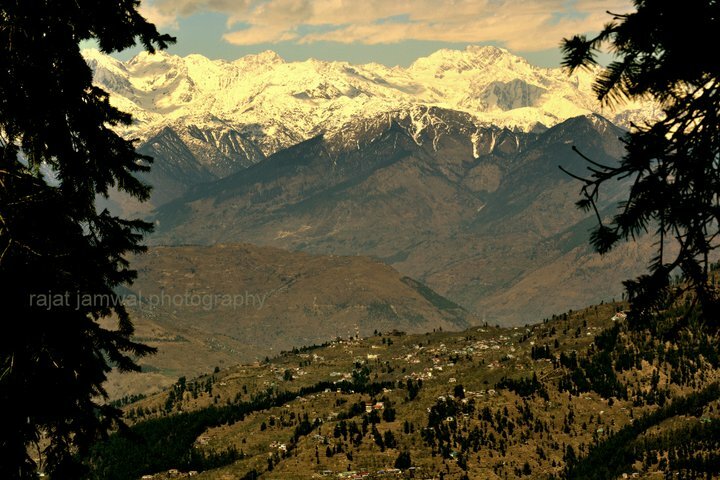 It offers the first full view of the Himachal snow clad Himalayas from a spectacular near distance. It is surrounded by a forest of Pine, deodars, oaks, and firs. It has an excellent ski slope. The famous Hatu temple is 7 km from Narkanda at an elevation 0f 3457 m. Hatu also offer a day’s hike to the top and back, through a dense forest. The top of Hatu has a wonderful wood carved temple. 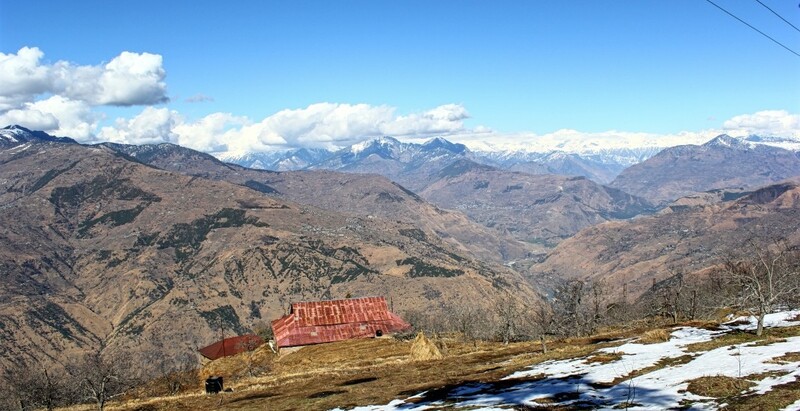 Hatu offers a panoramic 360-degree view of the mountains and valleys. 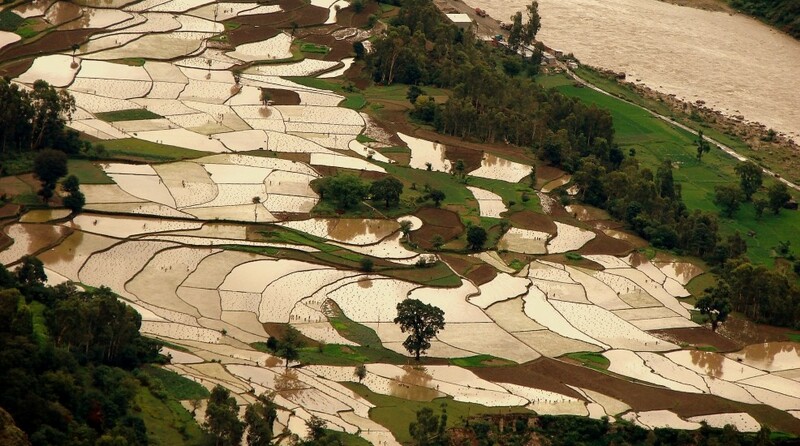 Kotgarh is beautiful valley at an elevation of 7,000 feet overlooking the Satluj River and snow clad sub Himalayan Range. The place is famous for its Apple and Cherry orchards. This village is 80 kilometres from Shimla on the old Hindustan Tibet Road. The Road bifurcates from the National Highway 22 at Narkanda toward Kotgarh. 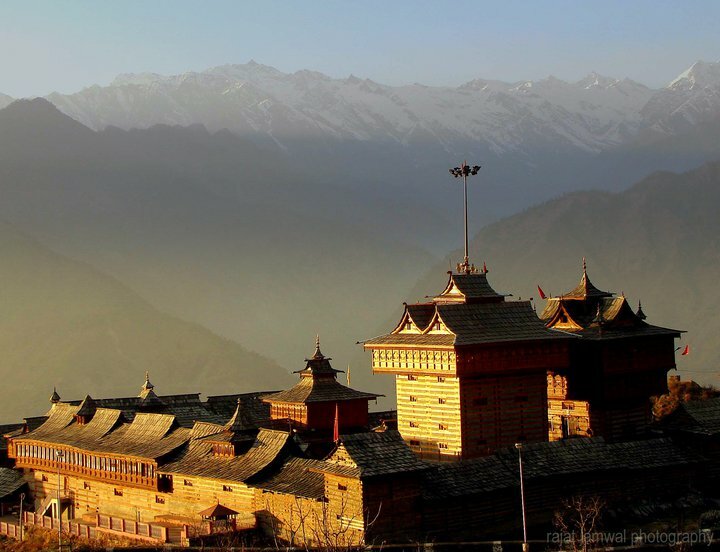 This scenic valley offers a marvellous panorama of mountain range, the far ones being snow clad and the near ones being covered with thick deodar trees. In the lower portion of the valley flows the river Sutlej. 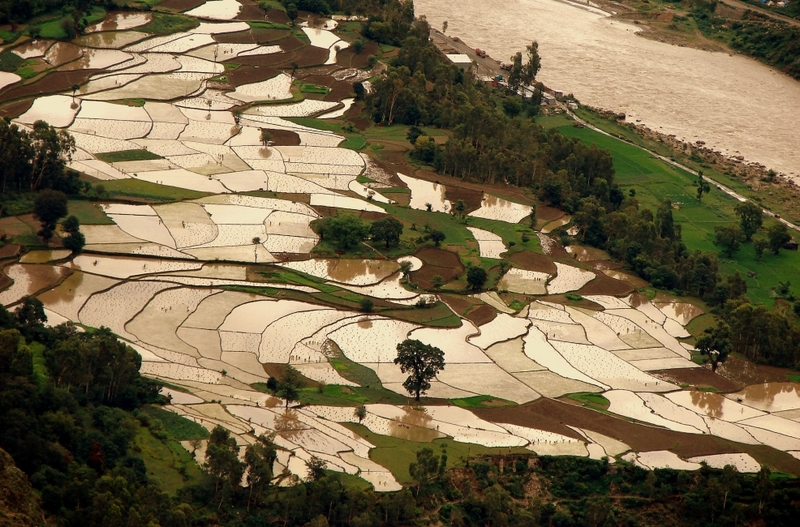 The area is dotted with huge apple plantations and farmhouses amidst the terraced fields. There are lot of short walks through the forests and apple orchards. In 1815, Kotgarh became a British territory after the Gurkhas were defeated by the Britishers. The Britishers were impressed by the location, and beauty of the valley. The British encouraged missionary work in the area. You can find the impact of British rule here. 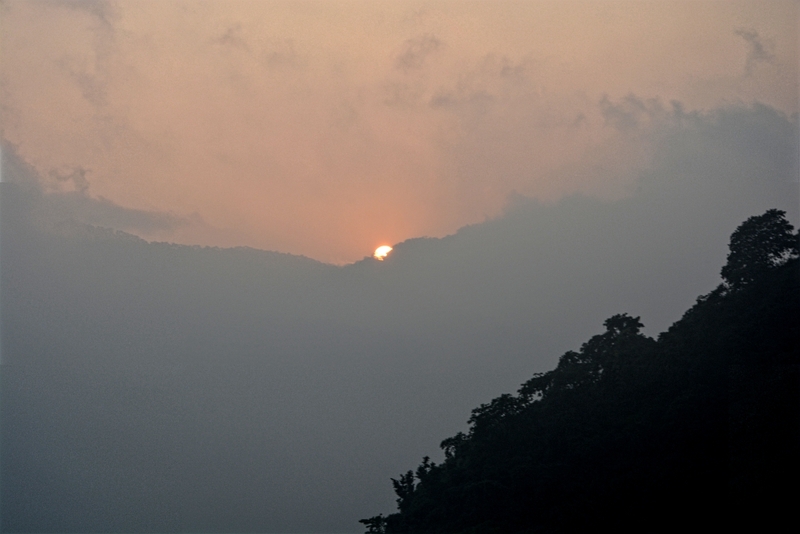 Kotgarh is also an ideal holiday location in the Himachal Himalayas. It was in 1916 that an American missionary from Philadelphia, USA, by the name of Samuel Evan stokes visited this place. He had initially come for spreading the teachings of Christianity, but he was so allured by the people and beauty of the area that he decided to settle here permanently. He married a local girl, by the name of Agnes Benjamin. He converted into a Hindu and renamed himself Satyananda Stokes. The descendants of Satyanand Nand stokes still live in kotgarh. Satyananda Stokes planted the first commercial apple farm of the area, with plants imported from the famous Stark Apple Nursery growers of Louisiana. As he was a great social worker, he encouraged the local farmers to grow apples in their fields. It’s been 100 years since he propagated the first apple trees here, which still reap rich harvest, and the valley is one of the wealthiest in the Himalayas. At a modest altitude of 1350 m, Dutt Nagar is a small hamlet situated on the banks of River Satluj, on the N.H. 22, enroute Kinnaur and Spiti. It is 120 km from Shimla.The village is famous for its almond, pear and Plum Orchards. It is an ideal place for a mid-way stop between Chandigarh and Kinnaur. It is also a base for treks up the Mural Mountain near Sungri, Shrikhand Mahadev Trek, and Sewalsor lake trek. At an altitude of 2313 m, Sarahan is 175 km from Shimla. 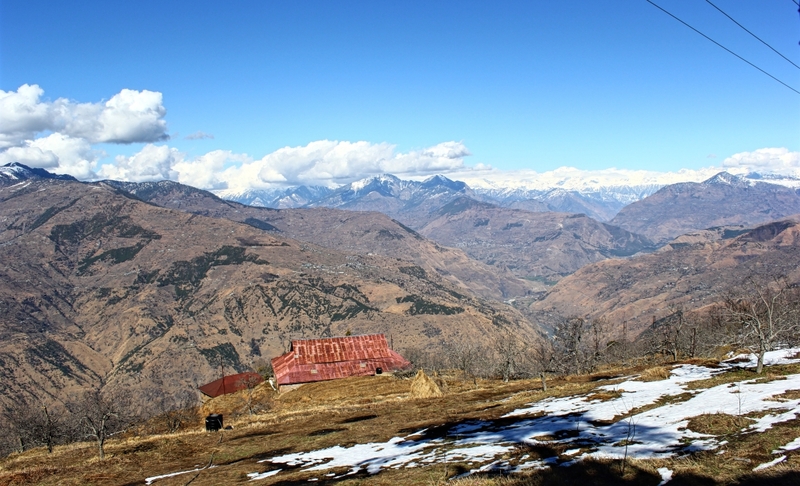 25 km from Rampur Bushar; from a place called Jeori, you take the hairpin turn toward the right. Sarahan is 17 km from Jeori. Sarahan is known for the Famous Bhimakali Temple. Sarahan was the capital of the erstwhile Bushar Estate. The view from Sarahan is awesome. The snow covered peaks are just in front of you. You can also view the Shrikhand Mahadev peak. There is also a bird breeding centre here. There are plenty of short walks and excursions from Sarahan. 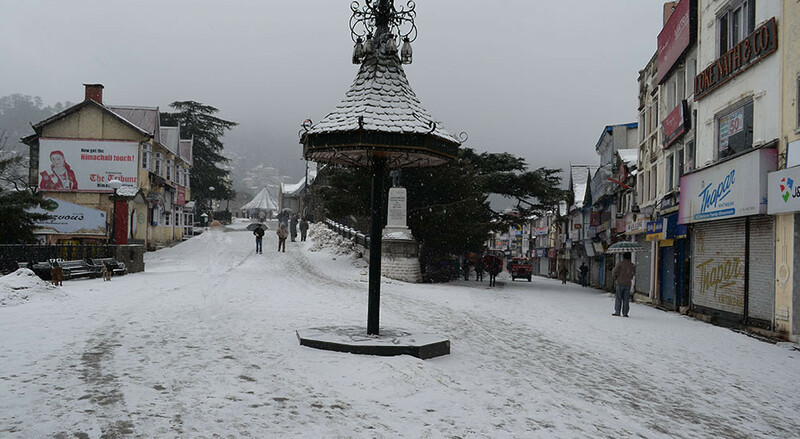 Kharapathar is 85 kms from Shimla at an altitude of about 2700 m. It is a perfect leisure destination in the heart of nature’s generous blessings to the area. Lush forests, wide views, excellent walk and hike trails and the charm of apple orchards make this a perfect leisure destination. A trek to mouth of Giri Ganga, and the meadows ahead, through deodar woods is very famous. One can also drive up 7 km to Giri Ganga. Located at an elevation of 1442 m, Hatkoti is a small town on the banks of River Pabbar and it is about 102 km from Shimla. Hatkoti is famous for Hateshwari temple. Hatkoti also has a regional centre of the Mountaineering Institute in Manali. It is a great base for trekking and mountaineering activity in the Pabbar, and Chanshal region. 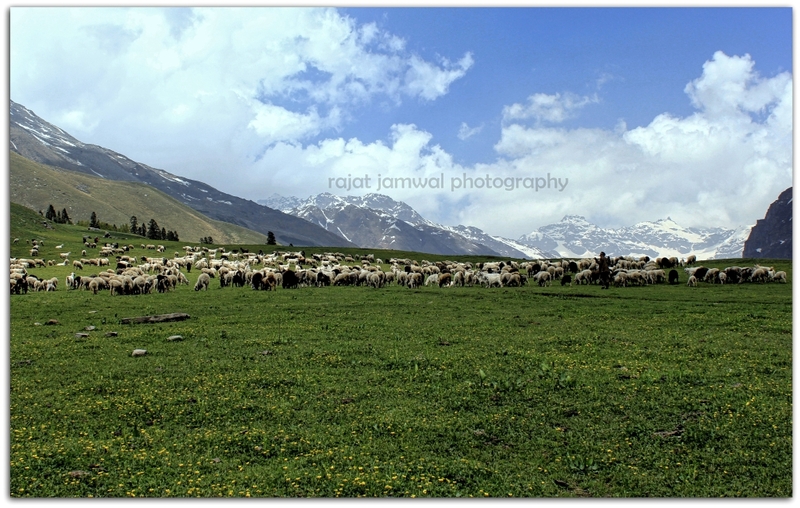 Chanshal is a mountain area, which divides the Dodra Kawar area with the main Pabbar valley – the Rohru Chirgaon area. At an altitude of 3750 m, the pass is 180 km from Shimla. The pass remains open from May to October and is covered with snow for the rest of the year. A very good place to hang out if you enjoy adventures and are ready to invest time in travelling to see the less explored beauty. The Chanshal pass is also known as Chanshal valley and offers amazing scenic beauty of the Himalayas. There are many small lakes here, which one can trek too. The nearest station across the pass is Larot. There is no accommodation available at the pass.